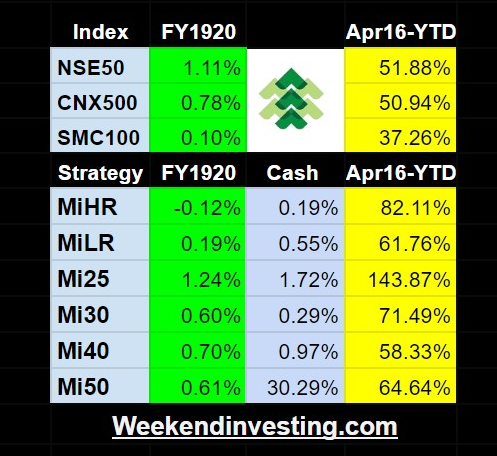 Q2 July to Sep 2017 quarter has been a great ride for the Mi25 strategy. We started the period at +17.49% absolute gain and ended the period at +34.01%. The CNX50/ CNX500 also moved from +3.8%/+4.2% to +6.7% /+7.6% in the same time-period. The performance of Mi25 has been outstanding since the beginning of the year and it has been building on its out-performance ever since. The max drawdown witnessed during the period was -11.65% on 11 Aug 2017 while the highest point was +39.26% on 20 Sept 2017. The stocks that powered the mi25 performance the most and which continue in the portfolio this year are..
while some of the key existing laggards are.. The strategy has 0.0 % cash at the end of the quarter and is fully invested. There were no notables stocks picked during Q2 and most gains continue on stocks picked earlier. The outlier gainer here is GOACARBON at 3.4X+ gains. Overall it has again been another good quarter for Mi25 this FY . We are very confident that this FY will close on a very positive mark. Have a great Q3 FY17! Subscription to Mi25 is now open again. Details are here. Dear Alok, Is it possible to post Mi25 returns from 1-June 2017 to till date? Sorry Alok I meant 1-June 2016 to till date. That is great for system driven model Alok no doubt. Keep it up. If you take care to make sure no junk is bought like that cable co you have real world model which can give run for money to all MFs. BSE Smallcap Index and Nifty looks highly over bought to me. I know that generally just before and around diwali they do NOT fall much rather they go up but I am really scared thinking about it post diwali. But you have nothing to worry as system will take care of it :-)..
Re the junk, it is part of the game. If you let discretion in, system is doomed! Oh man. You mean your discretionary portfolio performed better than 132.9 % from June 2016 to till date? how much is that? I buy only 4-5 stocks with max 15-18 months view but I combine discretion for picking a stock and my model which uses macro economic data to suggest me sectors. In June 2016 It suggested Steel Pipes, Agro chemical Exports, High quality yarn company and PSU Bank. Except PSU bank which is up just 20% all others doubled minimum. Even in PSU banks I think its ahead of time by 1 year.. But Macro model is suggesting big caution as of now :-(. Got lucky in discretionary i guess. Is up 200% approx since July 2015 when I started it. Dear Alok, can you explain the exit process of Stocks in Mi25? Do you follow any partial profit booking? Hello Sankar, The process is proprietary. No there is no partial booking. Hi Alok, is the MI25 list accessible? And do you update the list of stocks on a weekly basis?